The Year of Creative Reading continues, although not quite as I anticipated. I have been sidetracked by four books that aren’t on my original list of creative books to read for the year. Strike that. As a creative soul, it should not surprise me that I’m getting sidetracked. Because, you know, the library. Because, you know, it’s hard for a creative person to color (or read) within the lines. 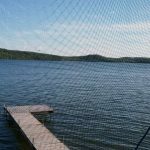 What books have taken me away from my list? 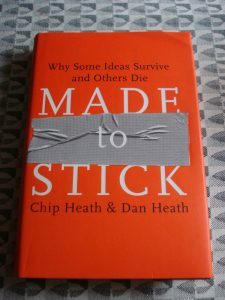 It started with Chip and Dan Heath’s “Made to Stick,” which is about methods for making ideas memorable. I own this book, so simply pulled it off the shelf to read. When I returned “Switch” to the library, I couldn’t not look at the shelf of new books. I immediately spotted two crisp white covers, one of which I recognized as a title by Malcolm Gladwell … “David and Goliath.” I’ve read every book by Gladwell to date. Four of his books sit on my shelf next to “Made to Stick.” I hadn’t gotten around to “David and Goliath,” so I snatched it up. 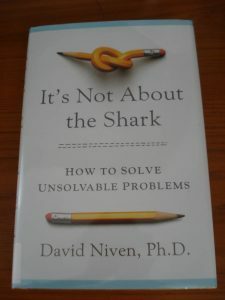 The book next to it was “It’s Not About the Shark: How to Solve Unsolvable Problems” by David Niven. It looked interesting as well … shiny object! … so I grabbed it. I can read Gladwell until the cows come home, which is quite a long time because we don’t own cows. 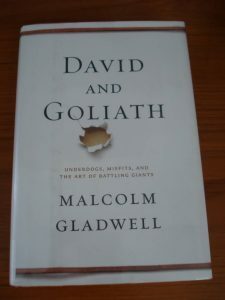 “David and Goliath” was as good as the rest of his books. He explains how those who appear to be at a disadvantage in society (like David) may not be as powerless as they first appear to be. Those who appear to have all the advantages (like Goliath) may be operating at a disadvantage precisely because of their advantages. “It’s Not About the Shark” drove me nuts for the first few chapters. The author starts with a story about how Steven Spielberg could not get the mechanical shark to work for his movie “Jaws.” He ended up scrapping most of the shark footage and merely indicating the shark, which made for a more powerful movie. After explaining this and repeating that you can’t solve a problem by looking directly at it, Niven provides story after story about people having problems, but not providing examples of how they solved them. And then I caught on. At the end of each chapter are 2 methods for dealing with problems by not concentrating directly on them. Plus, it felt as though more solutions were forthcoming in the text after the first few chapters. While none of these books is on my original creative reading list, they all would be useful to creatives. Perhaps I’ll just expand the list.